The figure below shows the number of unemployed workers and the number of job openings in September, by industry. This figure is useful for diagnosing what’s behind our sustained high unemployment. 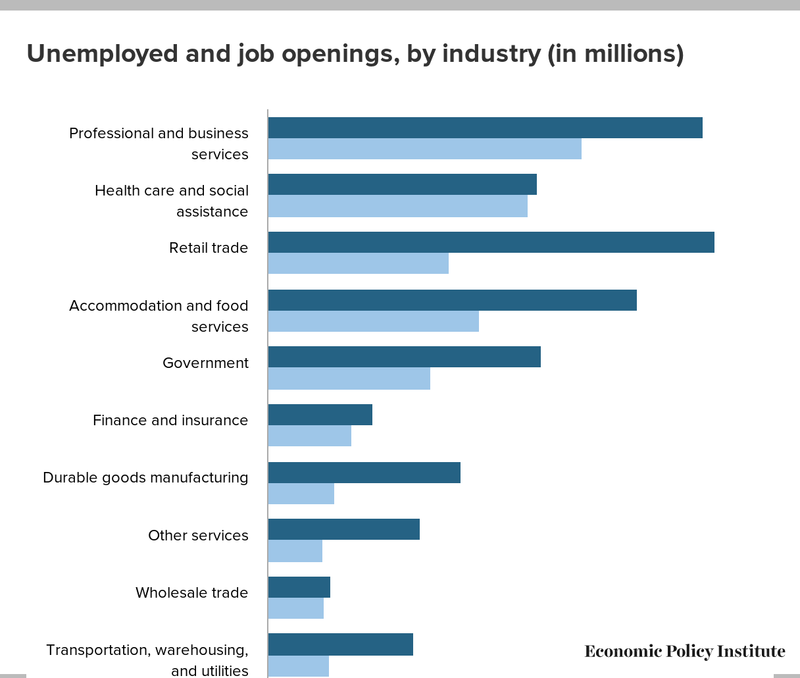 If today’s labor market woes were the result of skills shortages or mismatches, we would expect to see some sectors where there are more unemployed workers than job openings, and others where there are more job openings than unemployed workers. What we find, however, is that unemployed workers exceed jobs openings across the board. Some sectors have been closing the gap faster than others. Health care and social assistance, which has been consistently adding jobs throughout the business cycle, has a ratio quickly approaching 1-to-1. On the other end of the spectrum, there are 6.5 unemployed construction workers for every job opening. Removing those two extremes, there are between 1.1 and 3.1 as many unemployed workers as job openings in every other industry. This demonstrates that the main problem in the labor market is a broad-based lack of demand for workers—not, as is often claimed, available workers lacking the skills needed for the sectors with job openings. Note: Because the data are not seasonally adjusted, these are 12-month averages, September 2013–August 2014.